In more concrete terms, Trump has announced the immediate and unilateral withdrawal of the US from the Transpacific Trade Partnership, a move that not only leaves other participants to wonder about their future trade relationships with the US, but that also opens the possibility of a greater role for China in the region’s trade and investment policy. China is redoubling its efforts to make trade deals in the region, including the 16-country Regional Comprehensive Economic Partnership agreement. President Xi Jinping has emerged as a strong advocate for the benefits of economic globalization, extolling its benefits at Davos and beyond. Chinese, rather than US, firms may be the ones to capture the gains from new trade, investment and production relationships in the region. Regardless of how one views the details of the TPP – which was certainly not perfect, but on balance did promise benefits to U.S. consumers and firms as well as to consumers, firms, and workers in 11 other nations – it is difficult to escape the sense that President Trump’s “negotiation” strategy amounted to giving away any leverage the US might have had regarding trade and investment in the Asian region. One worries that the man who billed himself as a shrewd negotiator might have very little understanding of how trade and investment policies are made. It also seems reasonable to worry – as we await news of exactly how Trump will seek to remake the North American Free Trade Agreement – that the president fails to understand much about the nature of contemporary trade. This would not be surprising: during the campaign, hundreds of economists signed on to a letter noting problems (theoretical as well as empirical) with his analyses and proposals. But some dismissed these proposals as campaign rhetoric, designed to appeal to voters in economically disadvantaged areas, or to voters with underlying nationalist leanings, but not a basis for actual post-election policy. And yet, “America First” seems to ignore several key features of trade – and of trade politics. First, for those who take a more cosmopolitan view, and who worry about the life changes of those in poorer countries, contemporary economic globalization is not just about benefits to U.S. citizens and businesses. Rather, economic openness brings the possibility of better jobs, higher wages and improved education to individuals living in countries such as India, Mexico and Vietnam. These positive effects are by no means automatic; governments and local elites can make it difficult for a broad range of citizens to capture globalization’s gains. But such gains are rendered possible by participation in the global economy and by access to developed country (including U.S.) markets. Those developing countries that have achieved high rates of growth have done so by engaging, rather than avoiding, international markets. Second, even if one thinks in narrower terms, economic growth in foreign countries is a boon for U.S. firms and workers: as foreign citizens’ incomes rise, so to does their demand for electronics, pharmaceuticals and financial services. When US firms can expand their sales to foreign markets, US shareholders and employees benefit. And these internationally-engaged US firms, which tend to be more efficient and larger than domestically-focused US firms, can – assuming appropriate tax policies are in place — be an important source of tax revenue to the local, state, and federal governments. If the U.S. turns away from the global economy, other countries will step in to fill the void, capturing these gains. Indeed, President Trump seems not to appreciate that the U.S. firms that account for many of our exports are often the same firms that account for our imports. As Andrew B. Bernard and colleagues have recently pointed out, imports and exports are inextricably linked. Large, globally engaged firms engage in importing as well as exporting, as they have reoriented their production processes and supply chains to take advantage of efficiencies at home and abroad. Automobile manufacturing has been held up as a particular example, especially in the context of NAFTA: most car manufacturers source components from numerous countries (not only the US, Canada and Mexico, although rules of origin incentivize such sourcing), and many car components travel across the border multiple times en route to final vehicle assembly. But this phenomenon is broader than the automobile sector, and broader than the auto industry. Hence, any plan to punish or tax US firms that invest abroad, source abroad or import from abroad would also likely punish U.S. firms that export abroad, as the Peterson Institute recently noted. While one might certainly question whether U.S. multinationals should be prevented from shielding profits overseas and from avoiding U.S. corporate taxes, punishing these firms for their use of foreign sourcing and supply chains does not seem a viable economic – or political – strategy. Moreover, continued market access to U.S. exports abroad requires reciprocity: this is the cornerstone of trade negotiations. While governments certainly can, and do, bargain about the exact nature of reciprocal concessions – for which products, under what regulations, with which safeguards – it is a mistake to believe that one can gain access for US products overseas while simultaneously restricting imports. And it is worth noting that US exports to free trade agreement partners increased from 2009 to 2015 for 19 of the 20 countries with which the US has such agreements. In 2015, the U.S. had a $12 billion surplus in manufactured goods trade with its FTA partners. Therefore, the current administration should be working to expand opportunities for U.S. firms abroad, particularly in the service sector, which now accounts for more than 30 percent of total US exports. Services exports, which are greatest in travel, intellectual property, transport and financial services, are facilitated by technological change, and represent an important opportunity for US firms. Such exports to NAFTA partners grew 40 percent between 2009 and 2013; if President Trump wants to rethink the agreement, services are an area for improving agreement rules. Finally, leaving aside the possibilities for U.S. firms and workers represented by overseas sales and investment, trade openness benefits U.S. consumers. Imposing additional tax and trade barriers on U.S. firms that produce and source abroad, rather than here in the U.S., will mean that Americans will pay more for their clothing, their computers, their smartphones and their furniture. Withdrawing from trade agreements and removing reciprocal concessions for foreign countries will, similarly, mean higher prices for consumers (as well as for U.S. firms that purchase inputs from overseas). As such, consumers’ incomes – which, for some groups in the U.S., already seem insufficient to meet their needs – will not go as far as they once did. And since lower-income households spend a greater percentage of their income on consumer goods, these price hikes will fall more heavily on those who can least afford them. None of this means that economic globalization benefits every individual and every business in the United States, or that trade is not to blame for some wage stagnation and job losses ). Certainly, some firms and some industries lose out when trade barriers are reduced; for those working in such industries, the losses are heavy, the resources for adjustment are meager and the transition can be long and painful, as the “China shock” analysis has suggested. And trade agreements have sometimes not lived up to all of their promises, such as holding participating countries to minimal “core labor rights” standards for their workers, or leveling the playing field where bids for government contracts concerned. Yet many of those who have lost out materially have not lost out because of international trade and investment. Indeed, “America First” wrongly places the blame for wage stagnation, for rising income inequality, and for manufacturing job losses squarely on the global economy. But, as social scientists, we know that these outcomes are due largely to domestic tax policies; to a lack of educational opportunities and attainment; and to technological change and automation. Withdrawing from the Trans-Pacific Partnership, renegotiating the North American Free Trade Agreement or imposing a “border tax” on U.S. firms that source and manufacture abroad will not bring a significant number of manufacturing jobs to the U.S. What it may do, however, is generate increased pressures for immigration to the US, as countries like Mexico suffer the negative consequences of US protectionism; and signal to the global community that the U.S. is no longer committed to reciprocal commitments to liberalization, as embodied by the World Trade Organization. The fundamental flaw in “America First,” and in the trade pronouncements emanating from the Trump administration is that they assume trade to be a zero-sum game, in which any benefit to one economy necessarily hurts others. Imports are taken as a sign of weakness, while exports are viewed as a sign of strength. Trade and investment, however, are positive-sum relationships. This was true in the era of Adam Smith; it was true in the 1920s and 1930s; and it continues to be true, even as the nature of production, trade and investment have changed fundamentally. There certainly is room to negotiate the allocation of those positive gains, both among and within countries. Continuing to engage in the global economy; devoting resources to education and infrastructure, especially for less privileged communities; reforming tax and transfer policies; and offering consumers continued access to efficiently-made, foreign-produced goods are the way forward. 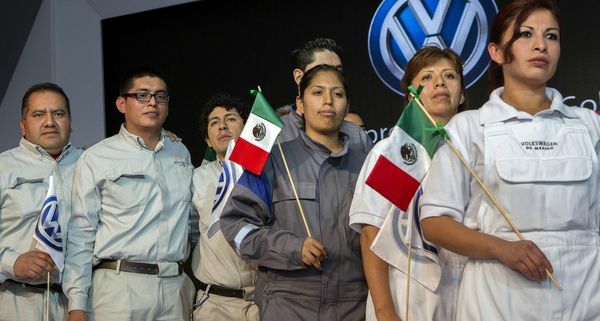 And these strategies spill over to those in other countries as well: workers abroad will continue to have access to the global economy as a pathway out of poverty and toward prosperity.